The outcome of the Mueller investigation will dominate the headlines, as will the response of the president's political opposition. Privately, I have an opinion. We all do. Publicly, I am about earning a living, finding opportunity, and financial defense. Truth is, I have no dog in this fight. I want the guilty exposed, and the innocent cleared, as we all should. We, as Americans, should not be rooting one way or the other, but only for truth... regardless of affiliation. It's not like I have not harped on the yield curve since well before the cool kids seemed to catch on. Now that there has been an inversion of the 3 month/10 year spread, which has predicted the last seven recessions, how worried do investors have to be? Is there a chance that the signal sent is a false positive? On that, with several key economic indicators pointing in various directions, it becomes almost too difficult to predict. Certainly, the gains made by long term Treasury securities would indicate that forward looking growth will be an issue. Technically, throughout the period that followed the "great recession" of 2009 through the 2016 national elections, the nation may have not seen an economic contraction, but I don't think anyone would have called that a good economy either. What is painfully obvious (and was obvious at the time, but why beat a dead horse?) was the error in the decision to increase the target for Fed Funds Rate in December. The economy is still trying to absorb that mistake and will be for several months more. The 3 month/10 ten year has "un-inverted' in the darkness of early Monday morning. Equity index futures have recovered nicely over several hours. I would think that in the coming week, certainly through the early part, there will be several more crossings made in both directions. The evolution of the market thought now has to follow three paths, all related, and the potential for a China trade deal is a contributing factor to perhaps all three, but not quite one of these paths unto itself. It would seem to me that key always will be corporate financial performance. We already know that this gets tough. Q1 revenue growth will likely print below 5% and stay there all year. Profit margin will surely contract in comparison, while headline earnings growth will almost certainly print with a minus sign. By recklessly running short-term rates to levels higher than reasonable ahead of what might have occurred naturally, the Fed created a U.S. dollar valued too expensively versus other reserve currencies to do anything other than harm international multi-cap performance. Again, this drags on growth, this drags on earnings. Tariffs are harmful here, but they do seem to be the one tool that successfully unsettles trade partners that had become accustomed to American compliance with their less than amicable practices just to turn a short-term buck. Lastly, what will lend support to asset prices across the board will be coordinated central bank response to weakening global economic conditions. I don't like this anymore than the rest of you. As an economist, I see this for what it is. The perversion of truth. The skewing of honest price discovery in order to delay the inevitable, yet untimed collapse of the debt super-cycle. Understand this. The collapse of confidence in the system will come before the collapse of the system itself. I can't promise you when. I can't even promise you if this will happen in your lifetime. Now, go peer in on one of those little tykes still asleep in their rack. I'll wait right here. Society's embrace of popular, sugar coated monetary and fiscal perversion in order to delay economic correction is beyond the individual's control. I get that. What is not beyond one's control is the ability to excel in the environment provided. Go take another look. You ready to fight, now? Growth will not die on the vine unless copper prices do too. While Friday was a painful day across the equity space with the Nasdaq Composite giving up 2.5%, the Dow Transports surrendering 2.3%, and the Russell 2000 simply puking 3.6%, one leading indicator for economic growth that remains under-covered by the financial media is copper pricing. The red metal had rallied with stocks through the early stages of 2019, after selling off just as hard in late 2018. Copper gave up 2% on Friday. 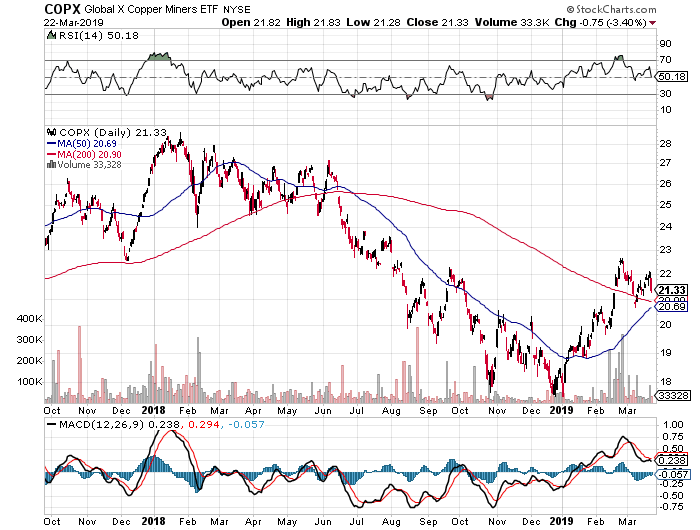 The lightly traded Global X Miners ETF (COPX) traveled 3.4% in the wrong direction on Friday, and would be an item for equity traders to follow. As for overt interest rate manipulation, futures markets trading in Chicago are now pricing in a 56% chance that the target for the Fed Funds rate will be at least 25 basis points lower by this December, with a 16.5% probability for multiple rate cuts by year's end. There remains no market for the probability of a rate hike. I don't give advice. That said, I am fine with telling you what I think, and what I'm trying to do. I play the game in front of me. I never assume. Though I fully intend to learn from analyzing my own mistakes, I try never to regret or punish myself for anything done with sentient thought behind it. Only when a mistake is made due to a lack of discipline will I really let myself have it. One must understand where the avenues of attack are, and in what depth of force any potential attack on your portfolio will be made. While maintaining exposure to growth, I feel that I must tamp down on the beta across most of my own portfolios. One thing I feel small investors must always understand, given they are sometimes playing with resources they actually need, is this: Sacrificing outperformance to the upside in the name of security on the downside is not a mistake. It's a reasoned decision made to defend those counting on one's ability to provide protection. Nothing is more important than honest, appropriate risk assessment. It is with great interest that I read that President Trump had told Taiwan that it should submit formally to the State Department an order to purchase a rough 60 Lockheed Martin (LMT) F-16 fighter jets. Entertaining the thought of such a sale while negotiations between the United Sates and mainland China are ongoing is a big deal. The U.S. has not made outright sales of advanced fighter craft to the independently governed, yet not quite independent island, since 1992. Key to note here is that Mainland China maintains a "One China", discouraging international recognition of the government in Taiwan. (Nobody mentions the fact that Taiwan also maintains a "One China" policy.) While President Xi's government in Beijing likely disapproves of such an overture made by the U.S. president, this issue becomes one more item to negotiate over in the coming weeks. On top of that, if the government in Beijing dislikes a potential sale of warplanes to Taiwan, they probably really hate the fact that the U.S. sailed two warships through the Taiwan Straight on Sunday. The U.S. Navy's USS Curtis Wilbur, a guided missile destroyer, and the U.S. Coast Guard cutter Bertholf made the passage through these waters that the U.S. sees as international. All eyes... okay... my eyes will be on Cupertino, California thus day. As the "It's Show Time" event unfolds, I see as possible a continued negative (sell the news) reaction to the larger selloff that began on Friday. I see the case for long-term investment in Apple (AAPL) as much based on healthcare services as on anything they do today. My target for the shares remains $197, and should these shares underperform the broader marketplace this day, I expect that I will at some point add to my existing long position. Should the news of increased competition in streaming entertainment force some additional weakness on the shares of Walt Disney (DIS) , I would think that I either add to that long or find some puts that seem worthy of a short position. Speaking of shorts, should Netflix (NFLX) shares approach the mid-$350's, I would think that I may take a profit and reestablish the short the next time the share run higher. However, that's a game time decision. 02:00 - Fed Speaker: Chicago Fed Pres. Charles Evans. 06:30 - Fed Speaker: Philadelphia Fed Pres. Patrick Harker. 10:30 - Dallas Fed Manufacturing Index (March): Expecting 8.5, Last 13.1. At the time of publication, Stephen Guilfoyle was Long LMT, AAPL, DIS equity, Short NFLX equity, Short DIS puts.